New Jersey has a variety of places that are very enjoyable for walking, earning its nickname of the Garden State. New Jersey is home to some of the top walking cities in the United States if you are looking for a place to live where more of the residents walk rather than drive. It also has many historic sites and neighborhoods. When you want to find a place to enjoy a walk, start with these resources. New Jersey Trails Association: This organization has a great online resource for searching for walking, hiking and biking trails in the Garden State. You can search by the name of the trail, by zip code, county, and by how it is used (hiking, cycling, horseback). Each trail has details including a map showing all of the amenities, full description, history, plants, animals, photos, and videos. 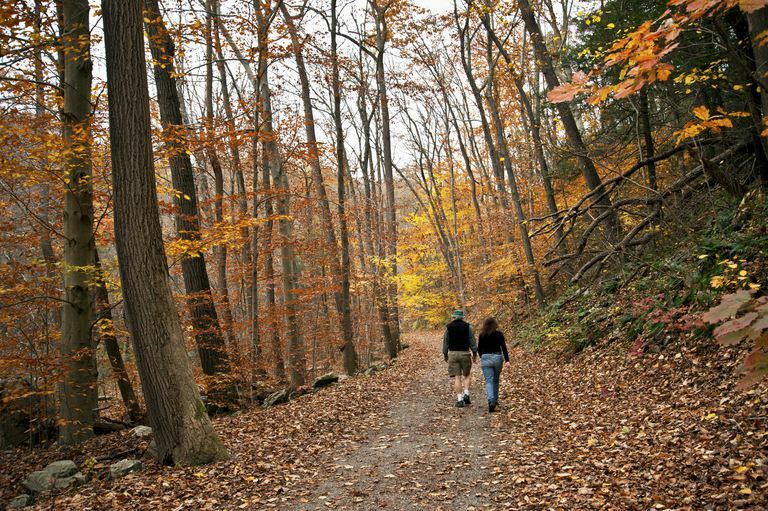 Year-Round and Seasonal New Jersey Walks: You can enjoy walking routes of 3 to 7 miles you can enjoy anytime. Search for "YRE/Seasonal Events" in this database. You will then go to the starting point, pick up a map, and enjoy the walk. The routes are sanctioned by the American Volkssport Association. New Jersey Walks at MapMyWalk.com: Browse routes submitted by other walkers or draw your own walking route. You can also use their excellent walking app to find walks. You can even do a virtual race with yourself or others on courses that have been saved. This is a great tool to use when are searching for a place to go for a fitness walk. Find competitive walking races, non-competitive walks, and fun walks in New Jersey. AVA Walking Events in New Jersey: These non-competitive walks open to everyone, sanctioned by the American Volkssport Association. New Jersey typically has a few traditional walks each year, which are ones with a staffed start/finish and marked routes you walk at the same time as other walkers. These walks are very low cost or may be free. Active.com New Jersey Walks: Use Active.com to find races that are walker-friendly, charity events, and fun walks. These events usually have entry fees and you can register online. Runner's World New Jersey Events: Check the listed runs to see if they accept walkers. Events often have a shorter route designated for walkers. You may need to check the finish cutoff time or contact the race organizer to find out if it is walker-friendly. Racewalking Events: These competitive racewalking events require using racewalk technique. This list is provided courtesy of Racewalking.org. Harriman Hikers Singles Walking: Singles are welcome to join in the weekly walks with this longstanding group. The hikes are usually enjoyed in Harriman State Park, but they also enjoy some other state parks in New Jersey and the southern Hudson Valley. If you want to find other walkers, use these resources. New Jersey Walking Clubs of the American Volkssport Association: These non-profit clubs that host walks open to the public. While there are only a couple of clubs in New Jersey, they host events throughout the state and in New York. New Jersey Hiking Clubs: See a list of clubs dedicated to trail walking or hiking in the Garden State.